It’s been awhile since I had to get up for the early college football game. Last Saturday was the reprise and I’m thankful that the Lavaca Street Bar had a bloody mary bar to kick things off. There was alot of talk about Midwestern sensibilities in the last week and I was surprised at how the Lavaca catered to that. 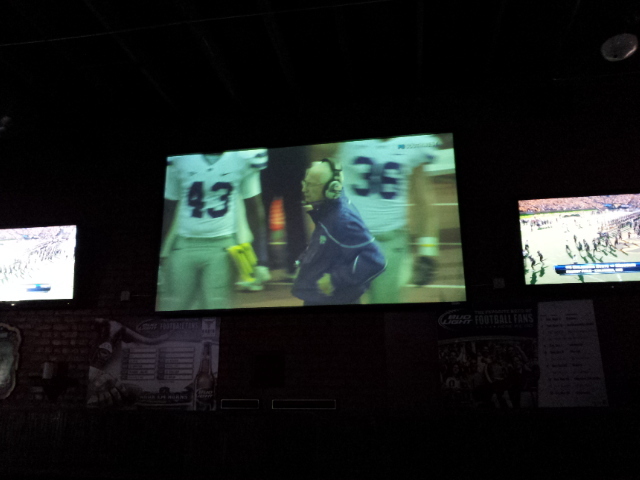 Speaking of the Midwest, it was Sunflower Showdown weekend and I had a front row seat, without actually being there. Did Lavaca Street Bar handle spectating well, or did I leave sucking on some cheese curds? Let’s find out. 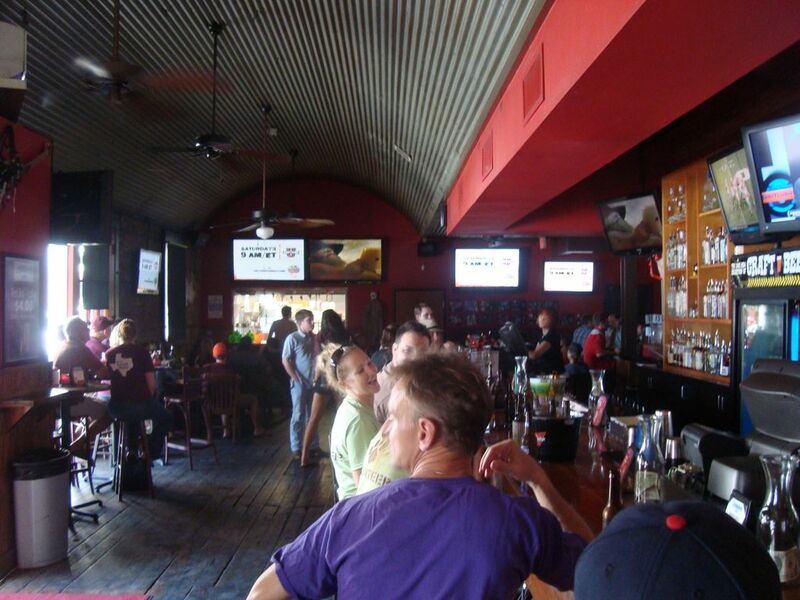 Walking in, you wouldn’t suspect that Lavaca Street Bar was a big sports bar. 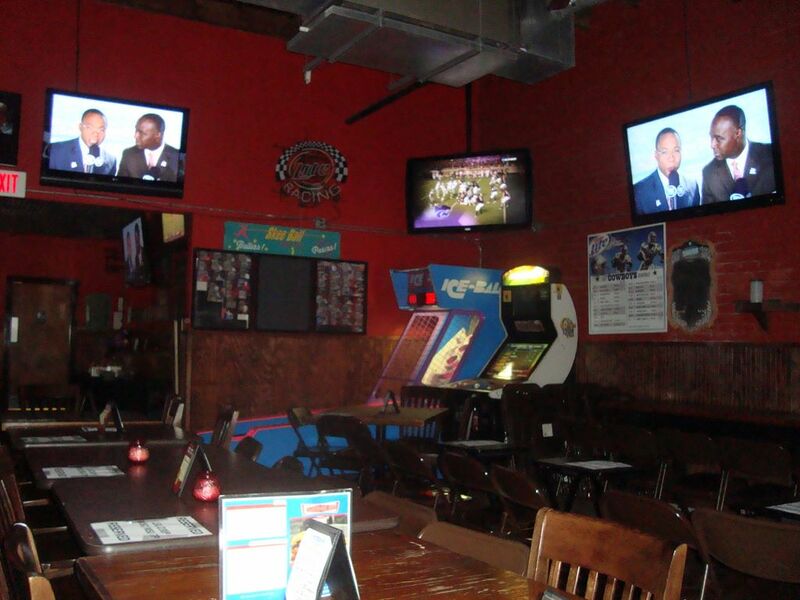 It’s another in a long line of sports bar that look tiny up front but huge in the back. All around the bar, televisions lined the place. In the back room there is a huge projector screen television as well. The Direct TV made sure I was able to watch my team up on there. The wireless internet is free but they had some kind of weird sign up page that made things hard to login. The best part of Lavaca Street Bar has to be the games. They have all the games that you need. They have Big Buck Safari, Golden Tee, a hard punch game, Pop-A-Shot, Skee Ball, and what I think could be a pool table. I see cue sticks but no table and I think it’s because of the bloody mary bar. At any rate, back to the Skee Ball. It’s a rare sight to see Skee Ball in any bar, let alone a sports bar. If you want to set yourself from the back, get a game like that in your bar. The service was rather sparse. There was essentially two bartenders for the whole joint. The female one was rather cute and the guy, well, was a guy. We had to get up from the back a couple of times to order food and drinks. They did come out here and there though. The guy was nice enough to setup the whole back room for my games so I can’t dog them too much. He also turned the light on for me when I was getting my bloody mary because the place is real dark. Like go to sleep dark. Now on to the beer pairing. 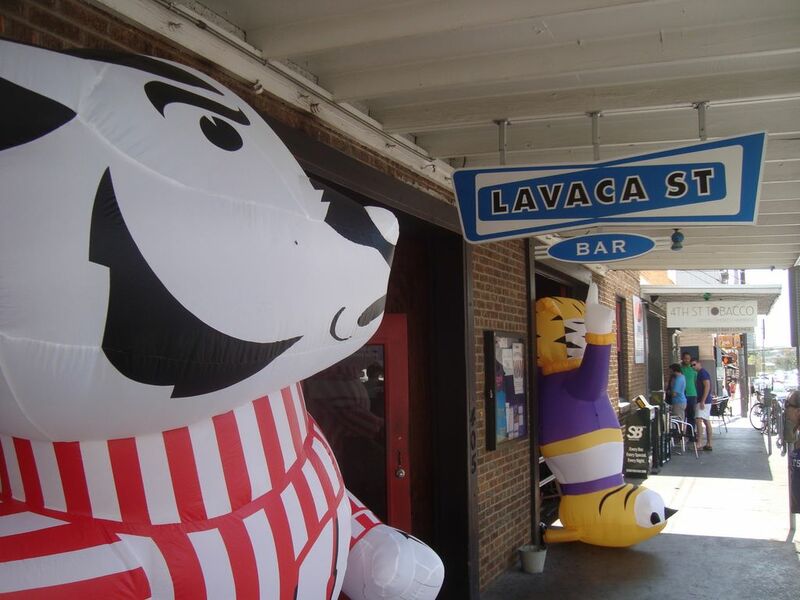 Lavaca touted some Midwestern specials like cheese curds and brats. Guess what I got. The cheese curds were good but not northern Iowa good. I think the ones I make are better. 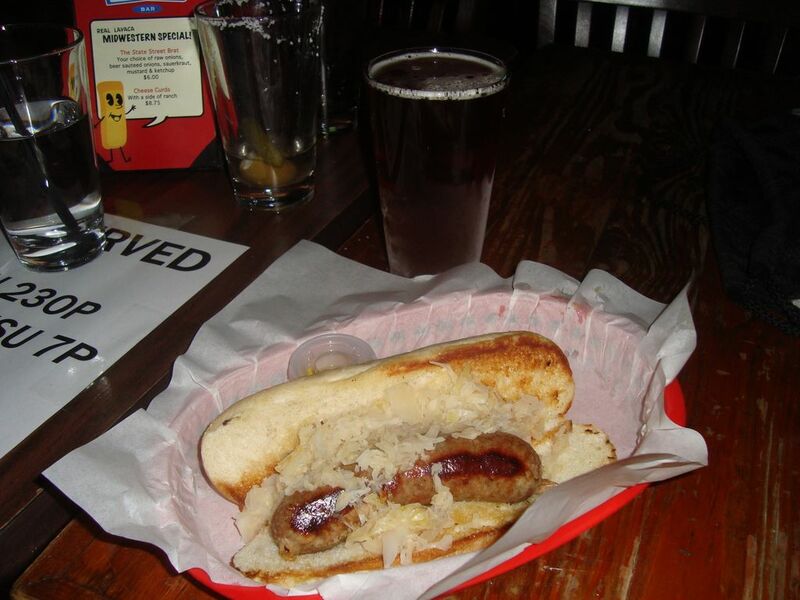 I chose to have Wastach Brewery’s Pumpkin Seasonal Ale with the bratwurst. I wanted to do an Oktoberfest type ale but that was the closest thing they had on tap. I’m so glad I chose it. It has to be the best tasting pumpkin beer I’ve ever had. The brat itself was tasty but everything around it was average. The mustard, bun, sauerkraut, and even the basket was very low rent. But hey, that’s part of the appeal. The Sunflower Showdown was the main event for the weekend for me. For some reason I was real scared about Kansas. Boy was I ever wrong. Kansas quarterback Jordan Webb has the 2nd highest passer rating in the Big 12. He did a good job, but the rest of the team was terrible. Meanwhile, on the other side, Kansas State’s Collin Klein put up all star numbers. He ran for 4 touchdowns and actually threw the ball pretty well. It helps when you are playing one of the worst defenses in FBS. Methinks Turner Gill’s job is in serious trouble right now. The other games were a little more competitive. I got to watch was Missouri and Oklahoma State duke it out in Columbia. Seeing as Missouri no longer thinks they are Midwest material, it was nice that the Cowboys beat them down. Well, it wasn’t a beat down so to say, the Tigers kept it nice and close. I missed out on LSU vs Auburn because I was busy Halloween shopping. I also missed out on most of the action in the evening because I went and watched White Denim at Stubb’s. So the first big Hail Mary of the year that put Michigan State over Wisconsin was not to be had for me. Thanks to a lightning delay, however I watched the end of Texas Tech upsetting Oklahoma. It has begun. The undefeated teams are starting to drop like flies. I still don’t know what to think about the weekend. I certainly didn’t expect Oklahoma being the team with losses going into this weekend’s game against Kansas State. Lavaca Street Bar had a super sweet setup, even though it was too dark and you had to try real hard to get service. The food is almost food truck level, which can be real tasty but lacking on the presentation side. I’d recommend this place to just about anyone if they want to duck in and see some great football. They have reserved areas for alumni groups like LSU and Wisconsin so be careful when you go.